The Brookings Institution, a liberal think tank, has put out a new study titled "OMG! How Generation Y is Redefining Faith In The iPod Era" (actual study is found here and here). "This generation could be - and has been – described as directionless, lacking in community ties and meaningful participation in communal life. This research builds a more nuanced understanding of this generation, revealing that Generation Y does seek community and meaningful involvements, though often in informal and non-traditional ways. Religious faith and commitment is one route by which young people find meaning, value and community, though their religious pluralism complicates what this looks like in practice. The diversity of Generation Y and the informality of much of their religious participation make it difficult to say that there is any one way that religion works in young people’s lives." As a member of Generation X, which the study describes as a "generation of seekers", to me Generation Y (born after 1980) is a generation of "individuals". There is a tremendous amount of choice available to our youth today, from buying an individual song on iTunes instead of a whole prepackaged album to not 3 major networks but 200-plus cable channels, covering a spectrum of interests to a myriad of religious groups, organizations, spiritual disciplines and online help. 3) To explore the ways religious identity informs the civic participation of today’s youth. Throughout, we were careful to note that religious life does not operate in a vacuum and we embed the role of religion in the context of their other concerns, such as finding a job or getting good grades in school." "Religious young people more active in politics, community. In this study, we find a strong relationship between religiosity and a broad range of volunteer activities with 79 percent of the most religious participating in volunteer activity in the last 12 months compared to 43 percent among the least religious. Religion is less closely tied to political and cultural involvement." As readers of Dawn's Early Light might already know, I am a believer in American Exceptionalism, which is supported by America's Judeo-Christian values. A weakening of these value systems could undermine America's place in the world, which could prove damaging if the US was to become more like Europe, a post-modern, post-Christian continent. Generation Y is more pluralistic in their social circles, with only "7 percent say[ing] that all of their friends are members of the same religion, and a near majority says that only some or a few of their friends adhere to the same religion as themselves." This bodes well for tolerance in American society in the future, but does it also represent that Generation Y is less beholden to religious tenets? Other interesting statistics from the study is the relationship between Generation Y identifying themselves as "religious" vs. "spiritual". 44% of the population identified with being "religious" while 35% viewed themselves as "spiritual", and 18% didn't identify with either label. When individuals use the word "spiritual" in describing themselves, I usually interpret it to mean that they do not belong to organized religion but believe in God or hold to New Age beliefs. For parents, other statistics support that religious families have stronger bonds. 75% of "the Godly" among Generation Y individuals "turn to family for advice (strongly agree)" compared to 57% of "the God-less". Religious affiliation also builds stronger character, on average, and improved self-esteem. 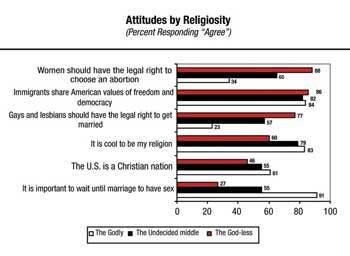 "Importantly, religious youth have a stronger sense of themselves than less religious youth. In other words, among the less religious, religion is not supplanted by a stronger ascribed or achieved characteristic. In fact, less religious youth are less strongly identified with anything at all, which suggests that religious group involvement is mutually reinforcing with other identities. Or, that feeling connected to a religious community or tradition heightens all other aspects of self-understanding. Religious adherence, in other words, builds social capital not just in terms of participation in civic life, but also in terms of connection with family, self-esteem, and self-understanding. As Christian Smith finds in his study of teenagers, religious youth rank higher than less religious youth on every measure of self-esteem." It is interesting to note that Muslims and African-Americans identify with their religion at almost the same rates as their family. This says a great deal for our progress in assimilation here in America. There are no silver bullets - old school methods of building community will not work with Generation Y. Support experimentation - To reach Generation Y, non traditional methods of creating community are necessary. The Power of Culture - Music, DVDs, film and the written word are powerful tools for conveying meaning. Mel Gibson's Passion of The Christ indie production is an example given. I agree with the findings on the whole. However, creating a community where individuals feel that they belong and contribute is important regardless of age, gender or ethnicity. People have a need to belong. While Generation Y may be better at determining that which seems stale or fake, I don't think they differ from my generation or my boomer parents. We all want to belong to something greater than ourselves. I know I feel my life is more enriched by my faith and community with other Christians, regardless of the form it takes, as long as it is personal and real and encourages me to think beyond myself. I highly recommend the full study to you. Open Invitation: Southern California Blogger Alliance and Other Interested Bloggers. I will post a link to your site below for anyone who wants to contribute their opinion on the above study. Pastor John Gillmartin, over at the Sheep's Crib has some good advice to Christians looking to reach out to Generation Y: "Our charter is to identify leaders among Generation Y; then nurture and equip them to reach out to their peers with the goal of raising up the next generation of disciples for Christ Jesus. My warning to those whom God calls to directly engage "Gen Y" is to avoid novelty at the expense of the Word who took on flesh and dwelt among us." John Schroeder at Blogotional has some insightful comments as well: "What I have found is not kids that need new ways to build community, but kids that are starving for it. All my wife and I really needed to do was give them a small taste, then they were addicted. 'The more things change, the more they stay the same.'" Rick Moore at Holy Coast relates the study to his life growing up compared to the age his daughter lives in and has some comments about the church's future: "All that being said, there's something about the power of Christ that transcends all the technical gizmos, and even Gen Y'rs come with a God-shaped void in their lives that can't be filled with gadgets and toys. The churches that can get their attention and show them how God's love can bring fulfillment to their busy lives will find their ministry to this younger age group very successful. Every church is going to have to try to connect, or else they will fade away as their congregation ages and is not replaced by younger folks." Religion is important, but then the question comes, "Religion in what form?" A good example of religion you don't want is the kind that shouts "Praise Allah" while committing suicide and murdering others at the same time. We know that perversion all too well. As far as belonging, I would suggest that the moment we are born, we are members of not only our own personal family but the larger human family as well. For direction and purpose, parents need to raise their children thinking that we are all here to live as wisely as we possibly can. The alternative, it seems, would be to not live as wisely as we can, and why would any rational person settle for that? Coud you explain to me how exactly generation y is "the Ipod Era". Operating system accepted, and anything pertinent?